We’ve already told you how to prepare for your make-up trial and what to expect – whether you know what you want, or you have no clue, you can rely on the make-up artist to make suggestions, try a variety of looks and colours, and inspire you to choose the best look for your wedding day. And the great news is – you can expect the same from a professional hair stylist. We’ve had a lovely and lively chat with Cathy McNulty – a professional stylist with her own studio, dedicated to making the bride’s hair look absolutely flawless on their most-documented day of all. And, ultimately, it all boils down to one thing: the most important thing about your hair trial is how you FEEL – don’t let anyone talk you into anything that makes you feel less than utterly fabulous, dahling. So when should a hair trial take place? According to Cathy it can really take place any time, but she recommends around six months before the wedding: “The more time you allow the better your hair can be prepared in the run-up to your wedding day – grow a few inches, have a colour update, and also treatments to make it healthy and shiny. Hair experts are flexible – they can work with you any time, but the one thing they absolutely must know is – what dress are you wearing? If you’ve been toying with the idea of going to your regular hair salon as opposed to availing of a professional stylist, Cathy says there’s a few things you might want to consider: “Hair salons have come a long way in providing all kinds of services including, of course, bridal hair. While you may know someone who does your hair regularly, or you’re thinking about saving some cents on your hair budget, there are a few things to consider. 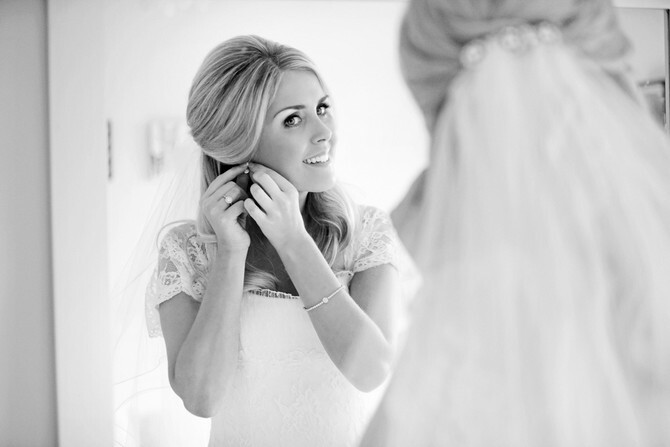 Your wedding hair has to be constructed well to withstand many hours while looking fresh and feeling comfortable. Specialists also take your colour into consideration, so they’ll style it in such a way that it’ll have an illusion of added fullness and highlights. Also, getting it all into a complete look with a dress isn’t always something you’ll have time to discuss at a salon. “A professional wedding stylist thinks in advance of your wedding day – outdoor shots, open top car, weather, photographers who want to get those perfect shots. They know exactly what your hair will go through, how to secure it, and what to do in case of any surprises. And don’t forget that once you leave a regular salon, you’re on your own – whereas the professional stylist is there with you until you’re ready to depart for the ceremony. “On your wedding day, the stylist will arrive at your home or venue and will work alongside the make-up artist, so there’s no need to coordinate appointments. At a salon, you’re more restricted for time, and more often than not, you’ll have to travel there, get your hair done, and then fit in your make-up too. That’s a lot to do on the morning of your wedding, with some extra stress thrown in due to all that extra travel. Do you offer hair cutting/colouring as part of the service? Can I take my own photos at the trial? How many styles do you usually show at a trial? Can I leave the trial with my hair in the wedding style, or will you take it down before I leave? Can I wear this hair style after the trial to think about it? Can I bring my mum/bridesmaid/sister with me to the trial for a second opinion? Do you specialise in certain styles/the style I’m looking for? Have you got experience in doing the style I’m looking for? How soon before the trial should I wash/colour my hair? How soon should I contact you to let you know about a booking? Is it okay if I don’t have my accessories or veil yet? This may not sound like fun, but do think of your imperfections that you’d like to hide. If you don’t like your ears, or you think your forehead is too big, tell your stylist. Find photos of styles you like and bring them with you, even if they differ from each other. Your stylist will incorporate the key points to make a unique style that fits you perfectly. Bring photos of your dress – front and back. Go with an open mind – it’ll help you establish a rapport with the stylist, and you’ll also feel more comfortable asking her to make changes. Bring your own camera so you have pictures to look over later. Don’t stress – the trial’s purpose is to find that ideal look, but it’s also great fun. It’s not often you meet a true professional you can talk to, so relax, get chatting, and you’ll have a great time. Tell the stylist about your hair history – have you had the same style since you finished Secondary school? Or are you an adventurous type, always changing something? Your hair should match your personality as much as your dress and overall look. Depending on how much time you have and how many ideas to try out, a stylist may be able to show you several options – however, they all work differently. Styling the hair doesn’t take long, but adjustments may take awhile, and the discussion and viewing the pictures will take up some time as well. Again, if you have particular things you want to try out, ask. Keep an open mind – if you’ve got a style, and the stylist says “I feel it would suit you better if we adjusted your hair like this…” – let them do it. You may be surprised what a difference an inch up or down can make to your overall look, and you’re dealing with a professional here – they have your best interests at heart. Ask the stylist for any tips they may have in relation to hair care – perhaps regular deep conditioning treatments, or switching to a different brand of shampoo? They’ll know very well what you need to do to make your hair look its best ever. Ask about washing – will your style work best if you wash your hair the morning of the wedding, or the day before? Wear your hairstyle home, have photos taken in different rooms, different light, see it in your own mirror, see how you feel a few hours later. A style that gives you a headache is not good – you’ll be uncomfortable on your wedding day. 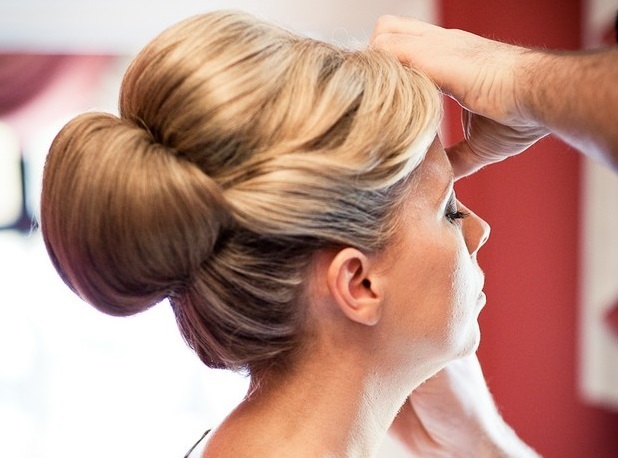 Give the stylist feedback on this – you don’t want a hairpin headache to ruin your special day! You may have a very sensitive scalp, and not be used to wearing your hair up. Pay attention to whether you have a habit of touching your hair in certain places – for example, always brushing your fringe off your forehead, or tucking strands behind your ear. Touching your hair may undo the style – so this is important to note. Look over all the pictures to see if you have any suggestions for changes. What if you can’t make it to your hair trial? You hair has to endure quite a bit (weather, travel, etc) considering the style has to last a minimum of twelve hours. Consider the nature of your hair. For example if your hair is prone to frizz or naturally curly, choosing a sleek , smooth style may require maintenance throughout the day, so ask for a style that works well with your texture. If your hair needs cutting, don’t just say it – show it. A “trim” sounds completely different to you and to a stylist. You may mean just the ends, but the stylist thinks it’s four inches. Show them exactly how much you’d like taken off. You may find that a stylist won’t let you wear the style home after your trial. It’s important to ASK this before your trial, as you may be expecting to wear your hair home. By asking you’ll avoid any disappointment. For the best experience and to help you make the best decision, schedule your hair and make-up trial on the same day – if at all possible. If not, bring photos of whatever appointment you had before to your next trial. Book your trial around six months before the wedding, it’ll help you feel confident about the style and ensure you make the right decision. One of the advantages of booking well ahead of your wedding is that you’ll have plenty of time to get your hair colour, condition and wedding day style exactly how you want it. For more info on Cathy McNulty, or to find out if she has your wedding date free, check out her weddingsonline profile. I’m glad you brought up showing your stylist what you mean by a “trim.” This wasn’t for my bridal hair styling, but my friends and I used to get trims that were always either too long or too short, until we started specifying. Always show your stylist what you want or odds are you won’t like it. Ask the Experts – Hair – I hated my hair after my hair trial!